Lisa Cooney retires from WLWT-TV in April after 30 years. Thursday April 4 update: Lisa Cooney anchors her final News 5 Today morning newscast on WLW-TV Friday, April 5. 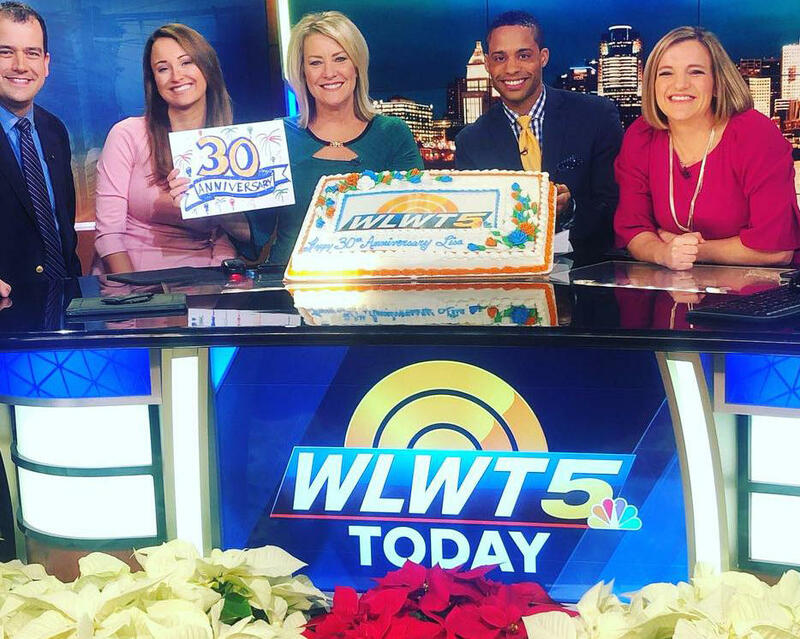 Original post Jan. 17, 2019: Forget what Lisa Cooney told me last month about how she loved the mornings, as she was celebrating her 30th anniversary at WLWT-TV. Before they brought out the cake, she was seriously contemplating leaving television. Getting up at 2:30 a.m., and being at work by 3:30 a.m., had taken its toll. "I’m tired," she told me today shortly after the station announced her final broadcast will be in April. "Thirty years is enough. I'm ready to go. I want to take some time off. I want to get some sleep. And plan the next chapter of my life." Since summer the thought of retiring "has been swirling around in my head. I talked it over with my family, and just decided it was time. I'm really excited," she says. Reporter Andrew Setters, traffic reporter Vanessa Richardson, Cooney, co-anchor Colin Mayfield and meteorologist Randi Rico celebrated Cooney's 30th anniversary Dec. 12. Her bosses were "shocked" and "very upset about" her decision. They didn't want her to leave, especially after News 5 Today won the November sweeps ratings. They offered a return to a day shift, as she had done 15 years ago, before returning to the morning show. Now it makes sense that Channel 5 has posted a new morning breaking news anchor position which could back up the News 5 Today anchors. That person will be part of the post-Cooney era team. Branden Frantz, WLWT-TV president and general manager, said in the station announcement that "it's hard to describe what Lisa has meant to WLWT. Her tireless work for more than three decades is a lasting tribute to the commitment she’s made to the people and communities we serve." "Lisa's experience and hometown knowledge has guided viewers through so many of Cincinnati's biggest news stories," said news director Jeff Benscoter in the release. "Working a morning news shift can be very demanding, yet it's something she did for most of her three decades at WLWT. It truly speaks to her passion for journalism, and her commitment to the people we serve every day." Cooney decided she wanted to go on her own terms after arriving for work in the wee hours too many times and saying to herself, "What am I doing?" A Northern Kentucky native, Cooney knows she's very fortunate to spend her entire career at one TV station, in her hometown. As I wrote about her anniversary last month, she was hired by Channel 5 in December 1988 as a part-time writer. A week later, she went full-time. She rose through the ranks from writer to an Emmy Award-winning reporter to anchor – in the mornings, then evenings and then back to mornings in 2004. As a reporter, Cooney covered the 1993 Lucasville prison riot – staying on-site for 11 days – and was part of the team that stayed on the air for eight straight hours as part of the agreement between the inmates and the FBI to end the riot, the station notes. She also covered Pope John Paul II's visits to the United States in New York in 1993 and St. Louis in 1999, and John Glenn's last space shot. In early 2001, she was off the air briefly while donating a kidney to a family friend. "I've been lucky. I've been blessed to spend 30 years in my hometown in a business filled with comers and goers," she says. "I feel good. I have nothing but happiness and contentment in my heart. And I'm going out on top," she says. Thirty years? Really? Lisa Cooney has been living on the air at WLWT-TV since 1988, mostly as a morning news co-anchor on what was the city's top-rated morning newscast during November sweeps. "I love the camaraderie among the team in the mornings. We are a different breed. We come in the night before or in the middle of the night," says Cooney, a Northern Kentucky native. Being a 25-year TV veteran, Mike Dardis certainly knows about TV's revolving door. After all, he became Sheree Paolello's fourth co-anchor in three years when hired by WLWT-TV from Seattle in 2012. But after Channel 5 offered him his second contract renewal, Dardis figured he was here to stay for a long while – and could take the risk of dating his co-anchor.